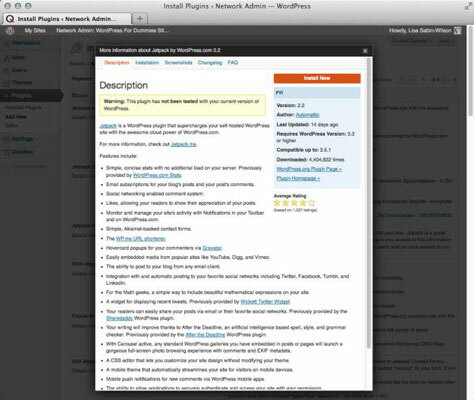 Log in to your site’s WordPress Dashboard and click the Add New link in the Plugins menu in your Dashboard. The Install Plugins page opens where you can search for plugins. When searching for, and finding, plugins on the Dashboard, you use the same method you used at the WordPress website in the Plugin Directory. Ever since WordPress provided the plugin search on the Dashboard, most users don’t use the WordPress website anymore. Find the plugin you want to install and click the details link to view its description. A description of the plugin appears in a pop-up window with a number of tabs at the top. These tabs can vary with each plugin and could include Installation, FAQ (Frequently Asked Questions), Screenshots, Stats, and Notes. Each tab provides important information about the plugin. Check out the FYI section. 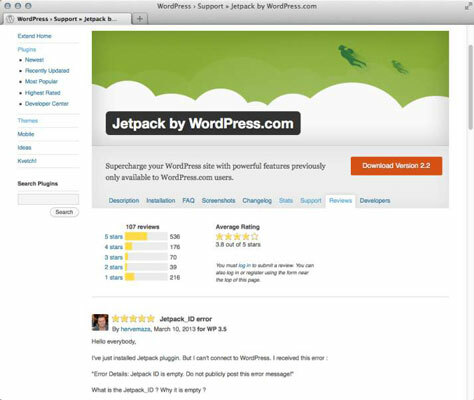 The FYI box on the right provides useful information, such as the version of the plugin, when the plugin was updated, what versions of WordPress are compatible with the plugin, and links to the author’s website. Check out the Reviews section on the right side of the plugin page in the directory. The rating section below the FYI box displays the average rating the plugin has received from its users. If the plugin looks like a good fit for your site and your needs, click the Install Now link on the search results listing in your Dashboard. Confirm the prompt that asks for confirmation on the installation results and click the Activate Plugin link. 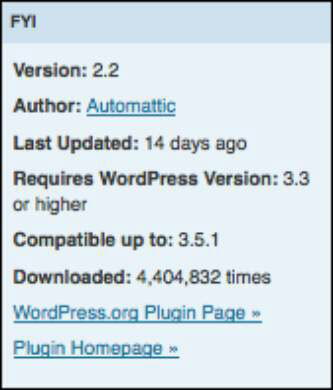 WordPress downloads the plugin, unpacks it, and has the files moved to the plugin’s directory. After the plugin is installed, you can activate the plugin or return to the Plugin Installer. The plugin is activated and becomes available for use. If the Dashboard screen displays any kind of error message after installing the plugin, copy the message and paste into a support ticket on the WordPress.org support forum to elicit help from other WordPress users on what the source of the problem is and how to solve it. When posting about the issue, provide as many details about the issue as possible, including the screenshot or pasted details.